On November 28 & 29, 1976 Elvis performed two shows at the Cow Palace in the flower-city San Francisco. These shows have been regarded as some of Elvis' finest performances during this busy bicentennial year for The King. 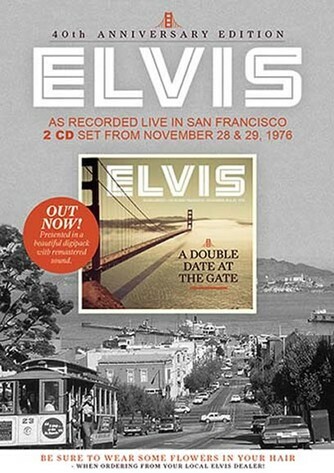 Gathered here in a beautiful 2-disc digipack, Elvis : Double Date At The Gate, is both shows in excellent quality. Unfortunately, the sound engineer was not able to capture the whole shows while recording, but on this release, you will find every second that was captured. The sound on both shows has been remastered by professionals and has never sounded better. Period.